Ok, this book has got my mind going in 20 directions at 100 mph! 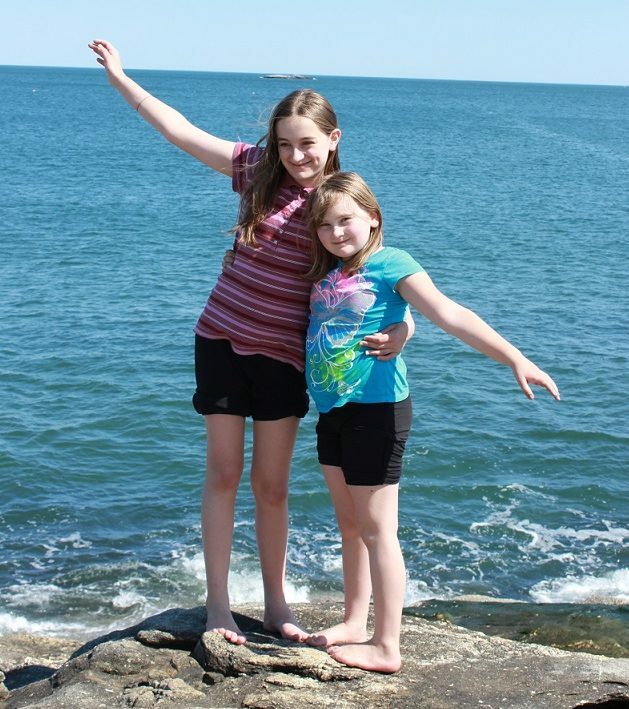 Even though I began the book feeling pretty good about what my kids have already learned to do around the house, the complaining and the whining had recently begun to drive me crazy. And Cleaning House has been a great way to evaluate how the teamwork is going in my home. I really enjoy Kay Wyma’s style of writing- both conversational and entertaining- while provided me with lots of serious stuff to chew on. 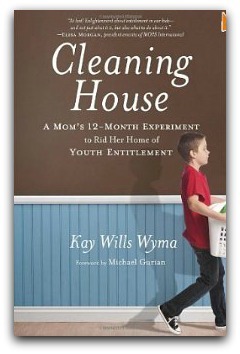 For those who haven’t read the book, Kay has an epiphany one day about how far her five children had traveled down the road to entitlement, despite her efforts with community service, and trying to teach them that “stuff will never really satisfy you,” coupled with realizing they really had no idea how to do anything around the house. So she decides to embark on a 12-month experiment, where each month has a different focus, and all 5 of her kids (ranging in age from 14 down to 3) will have to work as a team around the house, instead of leaving everything to their Mom, and her helper. Chapter 1= Month 1 The first task Kay assigned her kids was to make their beds and keep their bedroom/bathroom floor tidy. My first thought: SCORE! My kids have been making their beds every morning for years! Second thought: Whoa… do we need to work on the bedroom floor part! I decided that I wanted to do a little mini-experiment of my own, less intense because they already know how to do a lot- they just aren’t always doing it. However, I politely disagreed with the motivating factor Kay chose to use with her kids. She placed $30 in a jar for each child, and for each day they did NOT do the new task, she would remove a dollar. For starters, even with only three kids, I couldn’t afford that kind of incentive. (Especially not every month for 12 months!) Second, when we tried tying the kids’ chores to an allowance, any time we asked them to do something, came the big question: “Am I getting paid for this?” So we changed to a “no one is ever going to pay you to clean your room, or wash your own clothes etc,” and “we are all a team here, and everyone who lives here has to help out,” type of system. Because we want our kids to learn how to handle money, we have done some kind of small allowance in most seasons. And the older kids (who do more work) get more than the younger. For us, this ended the idea that someone should get paid just doing their fair share around the house. I couldn’t start my experiment with the bedrooms though, because there was something else that was more important in my mind… Chapter 2: Cooking! This post is part of a virtual book club hosted by Amy and Steph. You can see their posts at those links. Hope you’ll join in the conversation! Also check out Karrie’s post! Ok, I am late for work, but I will be back later today to read and add to the discussion. Can’t wait to see how you are shaking things up at your house! The complaining and whining is a big one at our house too! 🙂 I think we’ll be implementing strategies from this book for a long time to come. I am working out whether or not I should pay my kids allowance…your thoughts here and Kendal’s at my place have given me juicy things to think about. No one is ever going to pay them for making the bed, so why should I? Hmmmm. So, how do your kids earn money? Hi Spring – I’m a late book club visitor and boy, do I relate to your words about money. You just made a light blub go off in my head, because we sometimes pay our kids for chores, and this has lead to me asking, “Will you help me unload the dishwasher?” and then, “How much will you pay me?” (The answer: “Nothing. You get to live here. Come help me.”) SO, clearly we have an issue. But like you, we want our kids to learn about money and how to save, spend and give responsibly. So now I’m kind of back to square one about how to do that. Hmmm. Thanks for the good food for thought! For now, we just give them a small allowance (not quite as consistently as I’d like) and they have their birthday/Christmas money from relatives etc to practice handling money with! It seems that the more consistent I am with them, the more the whining fades away… it becomes routine. Still not sure why I eventually drop off the routine-radar periodically!